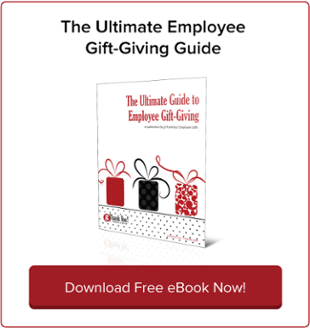 10 Last-Minute Employee Appreciation Ideas | gThankYou! Didn’t plan ahead for Employee Appreciation Day this Friday, March 2? Or are you just looking for anytime employee appreciation ideas to help you and your team brainstorm for the coming months? First, don’t worry that you haven’t planned ahead. A big appreciation dinner that takes months of planning — with catered food, entertainment and party games — can be a treat for employees, but it’s far from the only way to thank employees for their hard work. In fact, spontaneous “Thanks!” are just as important. Everyday expressions of gratitude show employees that their efforts are noticed day in and day out, not just once or twice a year. It gets to the heart of why employee appreciation is so meaningful: it communicates to staff that leadership is paying attention to them and cares about their performance. A few words of recognition from leadership mean a lot to rank-and-file employees, particularly in a distributed workforce, where face time with the C-suite is infrequent or nonexistent. Bottom line: people love to be noticed for what they do. Everyday appreciation is a reminder that their work matters. “Saying ‘Thank You’ encourages a gracious, polite and civilized workplace,” writes ChicagoNow’s Scott Huntington. Over time, thanking employees fosters a culture in which gratitude is shared frequently and effortlessly. And that has a real business impact: 78 percent of employees say they would work harder if their efforts were better appreciated, according to Limeade. Employee appreciation isn’t about fancy plaques and awards. It’s about sharing your appreciation in a thoughtful and meaningful way. Have fun this Employee Appreciation Day! Even though gratitude is simple, there’s no reason not to have fun with it, even on the fly. Try some of these last-minute employee appreciation ideas — you won’t need more than a day’s notice to undertake most. Spring is in the air! And that means warmer days, more sunlight and, of course, ice cream! Thank your team with an impromptu ice cream social. The supplies you need are easy to gather: tubs of vanilla and chocolate ice cream, a few scoops for serving, paper bowls and disposable spoons, and a variety of fun toppings (sprinkles, maraschino cherries, chocolate sauce, nuts, caramel). Have managers, or members of the leadership team if they’re available, scoop ice cream for employees. Take the first step to organize an employee-led committee to build year-round appreciation within your organization. It’s an engagement effort that’s worked well at the University of Calgary. It’s amazing how a breakfast spread of doughnuts, bagels, coffee and juice can set a positive tone for the rest of the workday! Wish everyone a Happy Employee Appreciation Day (or other fun holiday, like International Day of Awesomeness) and spend time socializing over the breakfast treats. Internal (or external) awards are a great way to show your appreciation. Let your nominee know privately that you’ve nominated them and why. Even if they don’t win the award, your praise and confidence in them will make a big impression. Be inspired to start a Thank You note-writing habit! Some of the most successful CEOs in history write hundreds of Thank You notes to their employees, customers and other shareholders every year. It’s a habit many started early in their careers — and it became a lifelong habit because it’s so effective and memorable. 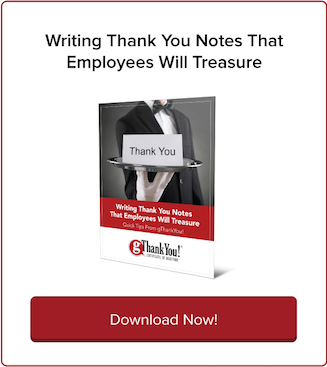 For step-by-step letter-writing tips, download our free ebook on writing employee Thank You notes at Thanksgiving or anytime of year. You may not have time right now to undertake a big employee gift program, but you can buy little gifts of appreciation to share with your team — bags of candy, tickets to a movie theater, $5 ice cream gift certificates, etc. Don’t forget to include a short note with your tokens of appreciation. It’s the simplest, most spontaneous way to show your gratitude, yet it’s also the most powerful. Feeling tongue-tied? That’s natural. Due to outdated myths, the workplace is the last place many of us feel comfortable thanking others. 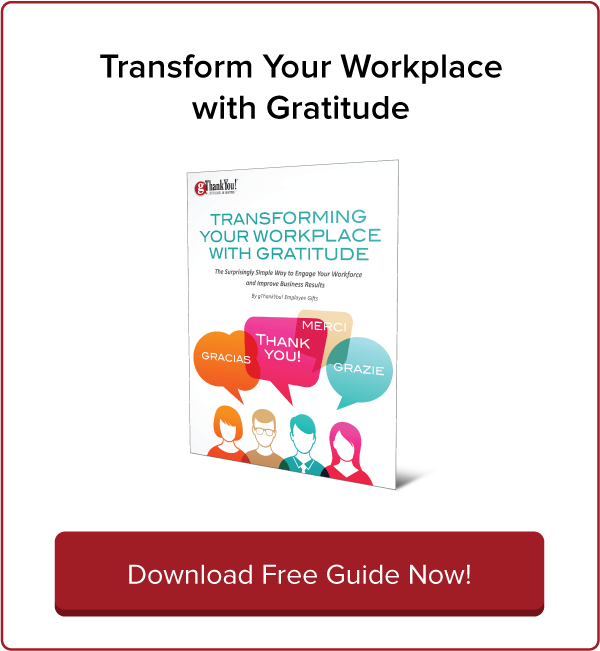 If thanking employees feels awkward or forced, read this excellent research-backed Greater Good Science Center article on why workplace gratitude is so rare — and how to change that unfortunate dynamic, today. However you choose to share your sincere thanks, your employees will appreciate you care. We hope you and your colleagues have a joyful day celebrating your workplace. Celebrate appreciation in the workplace all year long while invigorating your employee recognition planning for 2018! 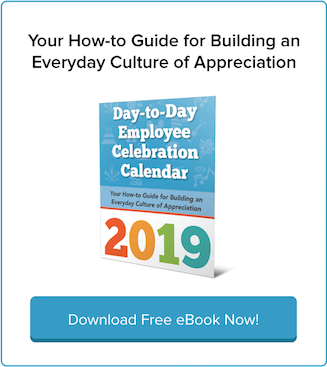 Download gThankYou’s FREE “2018 Day-to-Day Employee Celebration Calendar” today and start building an everyday culture of gratitude that employees will love. You’ll find inspiration and employee appreciation ideas for every month and day of the year.